How does the Android Ice Cream Sandwich update fare? It's a sterling, premium device from Samsung, but compromises have been made to fuse a phone and a tablet together that could be hard to get used to. The phablet phenomenon continues with Samsung's flagship (for now) larger phone-tablet hybrid updated to run on Android 4.0 Ice Cream Sandwich. But with the Android 4.1 Jelly Bean operating system already out for other devices, is it enough to keep the original Samsung Galaxy Note relevant? We've updated our review. The Galaxy Note was one of Samsung's surprise successes over the last year. Rocking a fancy stylus (or S-Pen), which we'd been assured by Apple was long dead, we admit to being a little sceptical on how well this device would be received. Let's just say we were more than just a little wrong. This device went on to ship by the truckload for Samsung - adopted by both serious geeks (the people we originally expected to take it to their hearts) and your average punter. Problem was, it launched on Android Gingerbread 2.3 at the same time Samsung was rolling out the flagship Google Nexus handset running Android 4.0. But now, that's all forgotten. And, on the arrival of the Samsung Galaxy Note II (which, in turn, rocks Android Jelly Bean 4.1), this not-so-little baby has been brought up to Ice Cream Sandwich. Falling somewhere between the tablet and phone goalposts, it's not as enormous as pictures may imply. But it is larger than your average smartphone. Dimensions come in at 146.85 x 82.95 x 9.65mm (5.78 x 3.27 x 0.38 inches) yet, at 178g (0.39lbs), it's fairly light considering how heavy it could have been. This is a trait we've come to expect with the Galaxy line, with the Samsung Galaxy S, Samsung Galaxy S2 and Samsung Galaxy S3 handsets also being light as a feather. 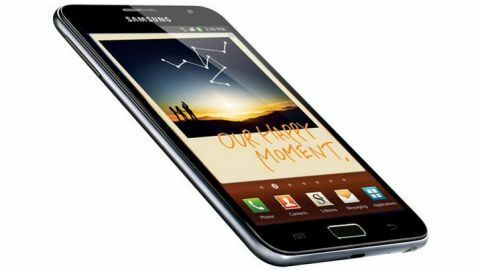 To look at the Samsung Galaxy Note, it looks just like a larger version of the Samsung Galaxy S2. The front is incredibly minimalist, with only a Samsung logo and home screen button visible to the eye (the home screen button is a little more rectangular than that of the S2). The front-facing 2MP camera and light sensor are there but almost impossible to see on the black model. The left-hand side holds only a volume rocker, the top houses the 3.5mm headphone jack and there's a power/lock-unlock button on the right. The micro USB charging and syncing port can be located on the bottom. The 8MP camera with LED flash is located in the centre of the rear portion in the same way it is on the S2 although, bizarrely, Samsung has, once again, chosen to have the actual glass covering of the lens protruding. We can't understand why it's not recessed as this merely makes the already vulnerable camera more prone to being scratched when the Samsung Galaxy Note is placed on a surface. The speaker is located near the bottom of the rear and just above the dock for the S-Pen (the fancy stylus) that Samsung appears to be so excited about. The crowning glory of the Samsung Galaxy Note is the screen: 5.3 inches of WXGA goodness (1280 x 800) and it is a belter. Samsung has always been renowned for its good screens, with even the Galaxy S giving us that wow factor this time last year. We were bowled over by the S2's Super AMOLED Plus, but the Samsung Galaxy Note just blows that out of the water. 285ppi is what it gives us, and not only are colours vibrant and sharp, but it looks easily as good as anything that Apple produces with a 'retina' label, even though it's obviously a lot bigger. A 2,500mAh battery should give you plenty of juice - but considering the size of the screen, which is always the biggest drainer, it may not go as far as one hopes. We'd say this is primarily aimed at the professionals. At least, on the surface of things, that's what one would assume. But then again, we have seen these being used by all manner of people on the tube. Students, older folk and more seem to want in. The fact of the matter is, this screen is portable enough to be comfortable and functional - and so it appeals to the masses almost (though not completely) as much as the Galaxy S2 or S3. At the time of writing, you can pick the Samsung Galaxy Note up SIM-free for around £400/AU$510/US$520. Not bad considering a few months back, you'd have forked out a third more. And, probably due to the fact that this is now old tech, has been superseded by the Galaxy Note 2. But don't let that put you off - the Samsung Galaxy Note is still an extremely capable device. You'll get it on a wide range of deals - free on some, if you're willing to sign away two years of your life - and it'll be on a par with iPhone 4S deals, now that the iPhone 5 is here.